Perfect Vacation Location And Pet Friendly Too. 1 Block To The Beach! Come enjoy spectacular ocean-front quality views at second row prices! As of Dec 2016 we have beautiful ocean views from the front porches! Eventually new construction will block some of this view so come enjoy it while it lasts. This classic 1940’s three bedroom, two bath Folly Beach house has all the charm of an original Folly Beach cottage with all the modern amenities to make your stay a perfect, comfortable vacation. You can listen to the waves from the porch or grab your coffee and walk 200 feet to the beach access for a morning stroll. In the evening, all the restaurants and night life of downtown Folly Beach and the famous pier are only three blocks away or you can use the fully equipped kitchen to enjoy a quiet evening in with family and friends. There’s also a public park and children’s playground two blocks away. If you are considering bringing a pet, please let us know. We’d love the opportunity to welcome them as our guests too! We’ve tried to think of everything you’ll need for your stay including WiFi, gas grill, flat screen TVs with satellite connection , outdoor shower, washer and dryer, and plenty of parking.Our three bedroom, two bath house will comfortably sleep six people. The master bedroom has a queen-sized bed and its own private full bath. The first guest room also has a queen-sized bed and the second guest room is equipped with a trundle bed that can be expanded to two twin beds. The open living room and dining room are perfect for both entertaining and casual relaxing. We have flat screen TVs in every bedroom and in the living room. 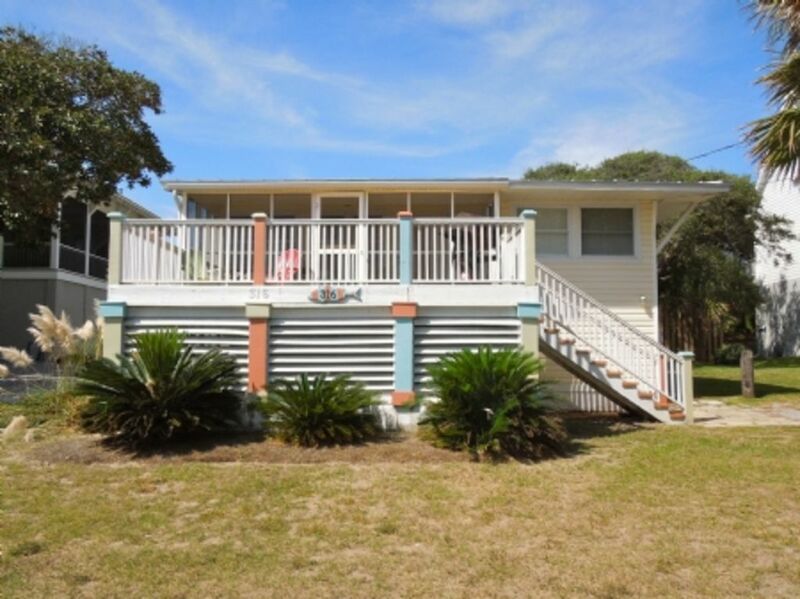 The beach access is just 400 feet down the road and across the street. We have a beautiful view of the dunes and ocean from across the street.